Once you’ve finished with pruning and spring cleaning in your garden and you’re wondering what fruitful things you could do with your branches and other waste, try lasagna gardening. Layer your waste according to Hugelkultur (German for cultivated hill or mound), a centuries-old technique. A bulky, wood base is built into a steep mound about 3 feet (1 meter) high with layers of branches, twigs, and organic materials. 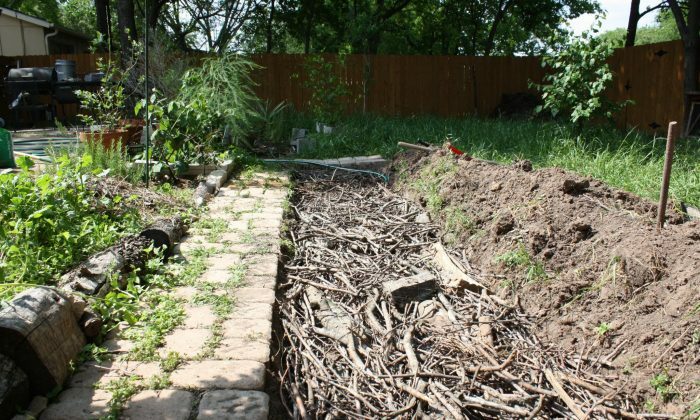 Urban homestead gardeners often have more compacted plots and building a Hugel could optimize space and soil conditions. Hugels are also a good idea for poorly drained or drier areas. And, of course, gardeners with an overabundance of woody and organic material such as leaves and grass clippings might build a Hugel just to put the precious organic materials from their land to use. Hugelkultur requires no tillage and less bending and stooping compared to the flat fields most gardeners are used to. People with back problems could ask some friends to help out with construction and enjoy lighter maintenance of their gardens thereafter. There are a few advantages to a lasagna garden. The logs will deliver nutrients for a long time. The manure and other fertilizing materials will feed the plants in the first growing season and the initial decomposition of the bulky woods draws nitrogen from the soil. The bulky woods, your Hugel base, release warmth through the decomposition process thereby extending the growing season. The base will act as a sponge and retain water, limiting the need for irrigation. This means you can go on that summer holiday without having someone come over to water your garden for you. Hugelkultur imitates a forest ecosystem in which the wood-enriched soil is full of life, soft, and spongy. 1. Start with your most bulky material (logs, roots, thick branches). Build your base in a north-south alignment for optimal light exposure. Make your Hugel about 3 feet (1 meter) wide. 2. Top the bulky material with branches, then a layer of twigs. 3. Fill in the gaps with aged manure, compost, layers of grass clippings, seaweed, straw, green leaves, mulch or other similar materials. 4. Cover with a layer of topsoil, about 1-2 inches (5 centimeters) deep. Your Hugel should be about 3 feet high to go three weeks without water. 5. Leave it to cure for a few months or start gardening straight away, sowing seeds or planting young plants. Alders, apple, aspen, birch, cottonwood, maple, oak, poplar or willow are great lasagna garden ingredients. You should avoid black locust, black walnut, and old-growth redwood, which contain toxins or do not decompose well. To fit your Hugel better into your garden design, build your base in a trench. If you remove sods doing this, place the sods upside down on top of your woody material. You can also make a stone path around your Hugel. By digging the path in a bit, you will have a bit more soil to go on top. Fortify the lower sides with stones, these will retain and release warmth, helping to extend the growing season. A 6-foot (1.8 meter) Hugel will last all summer without watering. The steeper your bed, the less compacted your Hugel will become over time, and the better you can work and harvest your garden.